Our laboratory studies the formation and repair of DNA damage in nuclear and mitochondrial genomes. We are particularly interested in the structure and function of proteins that mediate nucleotide excision repair and the role of oxidative stress in human disease. Faulty DNA repair can promote mutations, aging, cancer and cell death. 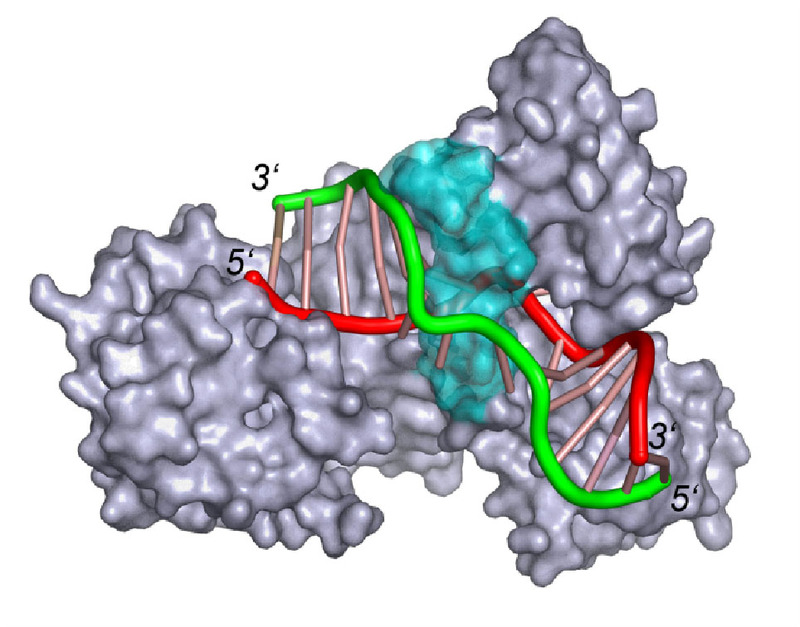 The process by which protein components of repair detect damaged or modified bases within DNA is an important but poorly understood type of protein-DNA interaction. The cell contains a series of pathways designed to protect its DNA from environmental and endogenous damage. 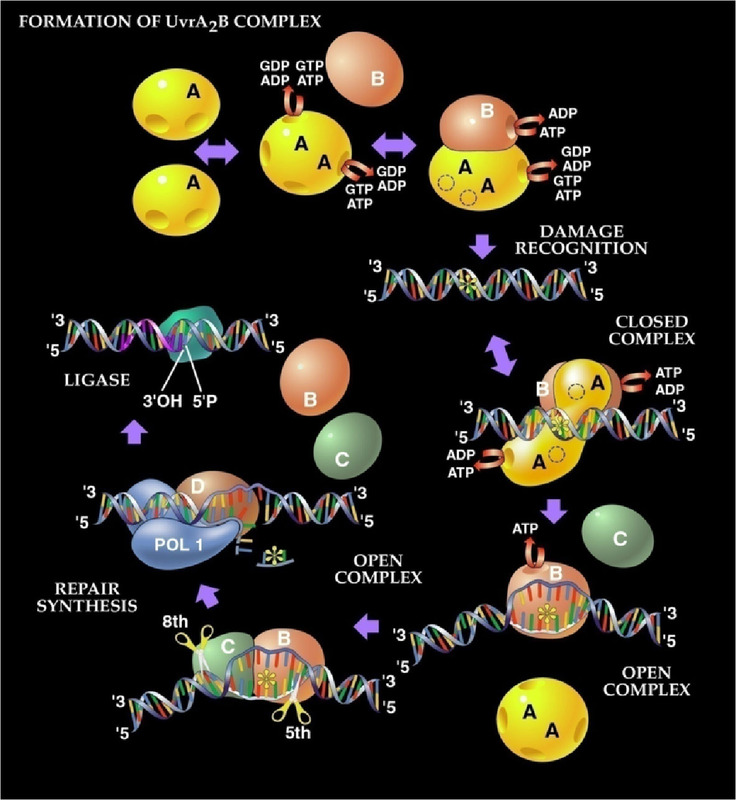 One of the most remarkable aspects of nucleotide excision repair (NER) is that it can remove a wide range of DNA lesions that differ in chemistry and structure. During bacterial NER UvrA , UvrB and UvrC proteins work together to identify and remove DNA damage (figure 1). Figure 1: A diagram of bacterial nucleotide excision repair pathway. Figure 2: Hypothetical model of UvrB bound to DNA based on our recent co-crystal structure of UvrB bound to DNA. These complexes are being visualized on DNA using atomic force microscopy, performed Hong Wang, Ph.D, and single-molecule techniques using quantum dot labeling (see Figure 3), performed by Neil Kad , Ph.D. at the University of Essex . These tools, combined with site-directed mutagenesis and biochemical analyses, allow for structure-function studies of the UvrA, UvrB and UvrC proteins, and form a basis for understanding the fundamental molecular processes of NER. The long-term goal is to have a complete understanding of how structural perturbations induced by specific DNA lesions are detected and removed by the NER machinery at the atomic level. Most recently we have began to extend our studies to similar proteins found in humans. Figure 3: Atomic Force microscopy of a complex of UvrAUvrB bound to DNA. 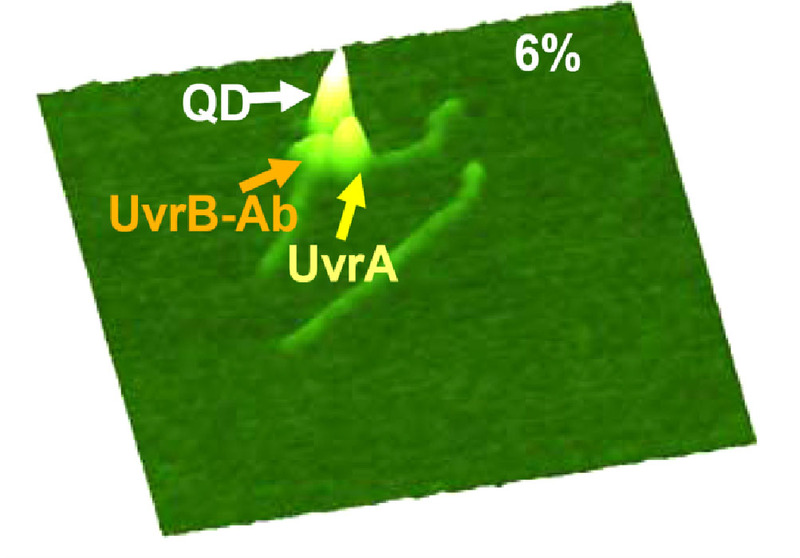 The UvrB shown here is antibody (ab)conjugated to a quantum dot (QD). Mitochondria (Figure 4) represent a important target of reactive oxygen and mitochondrial DNA (mtDNA) appears to be an early and sensitive marker of this stress. Many human diseases are associated with reactive oxygen including cancer, heart disease and neurodegenerative diseases. Mitochondria are essential organelles for generating ATP during oxidative phosphorylation. The mtDNA encodes 13 polypeptides, 11 involved in electron transport and two serving as subunits of ATP synthase. Damage to mtDNA is repaired, but prolonged oxidant treatment results in persistent mtDNA damage, loss of mitochondrial function and apoptosis. These observations suggest that mtDNA damage is important in the toxicity induced by reactive oxygen species (ROS) such as superoxide, hydrogen peroxide and the hydroxyl radical. Our group is testing the hypothesis that ROS generated in the mitochondria results in mtDNA damage causing a vicious cycle of damage: mtDNA damage causes a decrease in transcription and loss of essential mitochondrial proteins, causing a inhibition of electron transport and subsequent release in more ROS. This process causes further mitochondrial decline and many degenerative diseases associated with aging. We have developed a very sensitive DNA damage assay based on quantitative PCR that allows us to examine damage to nuclear and mitochondrial DNA from as little as 100 microliters of human blood. We are currently examining the role of mtDNA damage and repair in several human diseases including cancer and Friedreich’s ataxia. Figure 4: Living mitochondria stained with mitotracker red. CD Hughes, H Wang, H Ghodke, M Simons, A Towheed, Y Peng, B Van Houten and NM Kad. Real-time single-molecule imaging reveals a direct interaction between UvrC and UvrB on DNA tightropes. Nucleic Acids Res 41:4901-4912, 2013. C Haugen, NA DiProspero, JS Parker, RD Fannin, J Chou, JN Meyer, C Halweg, JB Collins, A Durr, K Fischbeck and B Van Houten. Altered gene expression and DNA damage in peripheral blood cells from Friedreich's ataxia patients: Cellular model of pathology. PLoS Genetics 6:e1000812, 2010. NM Kad, H Wang, GG Kennedy, DM Warshaw and B Van Houten. Collaborative dynamic DNA scanning by nucleotide excision repair proteins investigated by single-molecule fluorescence imaging of quantum dot labeled proteins. Molecular Cell 37:702-713, 2010. SC Wolski, J Kuper, P Hänzelmann, J Truglio, D Croteau, B Van Houten and C Kisker. Crystal structure of the FeS cluster containing nucleotide excision repair helicase XPD. Plos Biology 6:e149, 2008. H Wang, I Tessmer, DL Croteau, DA Erie and B Van Houten. Functional characterization and atomic force microscopy of a DNA repair protein conjugated to a quantum dot. Nano Lett 8:1631-1637, 2008. JJ Truglio, E Karakas, B Rhau, H Wang, M DellaVecchia, B Van Houten and C Kisker. Structural basis of DNA damage recognition and processing by UvrB. Nature Structural & Molecular Biology 13:360-364, 2006. JH Santos, L Hunakova, Y Chen, C Bortner and B Van Houten. Cell sorting experiments link persistent mitochondrial DNA damage with loss of mitochondrial membrane potential and apoptotic cell death. J Biol Chem 278:1728-1734, 2003. FM Yakes and B Van Houten. Mitochondrial DNA damage is more extensive and persists longer than nuclear DNA damage in human cells following oxidative stress. Proc Natl Acad Sci USA 94:514-519, 1997.